After reading a few reviews on the internet, I noticed there are two schools of review for The Fellowship of the Ring: Reviewers who have never read the books, or have only a cursory familiarity with the great story and Tolkien fans, who usually know every detail of the book. As a Tolkien fan, I discovered that I could not approach a review as if this was an independent movie experience. My fan knowledge of the book and Tolkien literary criticism kept intruding on any positive or negative thought I had about the movie. Most general movie reviewers who write for professional publications or commercial web sites are not part of the book fan base and their reviews focused exclusively on the cinematic aspects of the movie. Their typical response to fan concerns about the integrity of the story and themes of The Lord of the Rings is, Well, so what, this is a movie. It's a great movie, so stop whining. As if the fans really have a forum to complain. It is one thing to edit the story to fit into a movie format; it is another thing to twist the tale into a post-modern action flick. Modern movie pundits have neglected the cinema tradition of myth-making that flowered in Anglo-Saxon times and was diminished by the Norman Invasion. Peter Jackson had the opportunity to bring it back to life and discover its power of story-telling. My quick general summary is that The Fellowship of the Rings is a great movie, as if Tolkien wrote a great screenplay instead of a great novel. My quick fan summary is that the movie is essentially perfect after the Fellowship enters the Mines of Moria. Before this occurs, events are compressed in time and somewhat jumbled. Now, for some specific comments. The events from Bilbo's birthday party to the council of Elrond moderately suffer from compression. Too much happens in too short a time. I now understand the filmaker's dilemma in compressing LOTR into a film-manageable story. The best a filmmaker can do is edit the book events to the point of presenting a compelling story to people who did not read the books. This is the larger audience. I believe Peter Jackson essentially did this. Most reviews written by people who never read the book are extremely positive. The movie works as a movie alone, independent of the elaborate context provided by Tolkien in the book. The extended context created by Tolkien takes too much time to present in a movie. However, some context is necessary to simply understand the plot and characters. Otherwise, the movie descends into a jumble of incomprehensible events for the moviegoer who did not read the book. This occurred in the movie created by Ralph Bakshi and contributed to the negative reviews of that movie. I have read nothing like this for the Peter Jackson movie. The general audience apparently gets enough information from the introduction narrated by Galadriel. Since Tolkien fans have this context going into the movie, we can usually follow the action without additional context presented within the movie. Peter Jackson did some interesting things to keep the fans hooked in. For example, when Arwen comes into the story, Aragorn and the Hobbits are among the Trolls turned into stone from The Hobbit. However, there is no direct reference to this in the movie. If you did not read the book, you likely have no idea why these trolls are in the scene. This also occurred when Boromir confronts Frodo at Amon Hen. There is a stone seat up on a pedestal but Frodo does not sit on it. He has his visions while hiding from the Orcs next to the pedestal. Only Tolkien fans know that the Fellowship is at Amon Hen and appreciate the significance of the stone seat. This is a very effective form of editing. Rather than have the movie bog down with contextual explanations, Jackson assumes Tolkien fans know what is going on and the details work for them. Presumably other moviegoers view these elements as vivid background material. The most important task of the subcreator is construction of the fairy world: The perilous realm and the air that blows in that country. This includes the physical setting, characters and events. These must be realistic, convincing and maintain a coherent internal consistency. Otherwise, the fairy story appears false and cartoon-like. How well did Peter Jackson reconstruct Tolkien's fairy world? The Setting. New Zealand is Middle-earth. If Peter Jackson had simply filmed the actors among the fields and mountains of New Zealand he would have depicted Tolkien's world. Jackson took this even further. Hobbiton, Rivendell, Moria and Orthanc are depicted with perfection. In particular, Rivendell is magnificent. I want to escape there myself. Bag End of the movie is Bag End. The Prancing Pony and Lothlorien were good but could have been better. They were each depicted as rather sinister and dark. However, this is only in contrast to their depiction in the book. The time in Lothlorien was compressed and this resulted in depicting only a few of the nighttime scenes. Jackson also distorted the color palette in a few scenes. This detracted from realism and made the world appear fantastic and not enchanted. Characterizations. The great redeeming feature of this movie is the physical depiction of the every character in the story. Hobbits are Hobbits; Elves are Elves. Gandalf is the guardian angel of Middle-earth. Jackson even got his hat correct. Frodo, Sam, Merry and Pippin are perfect young Hobbits. Legolas is not the same depiction in the movie as he is in the book. Even at the risk of sacrilege, I will state this in clear terms: Peter Jackson's Legolas is better than Tolkien's Legolas. The Legolas of Peter Jackson's movie is the son of King Thranduil, whose skill and strength of will were powerful enough to kill a Nazgul in the night with a single bowshot. Tolkien stated in a letter that many readers apparently missed his understanding of the character of Legolas, seeing him as more frail than he imagined the character. I believe this occurs because of Tolkien's ambiguous depiction of Legolas. There were a few minor detractions from the characterizations. The first is the casting of Hugo Weaving as Elrond. I kept thinking, How did that sinister character from The Matrix get into the Lord of the Rings? The typecasting is a shame because if he played Elrond first, I would not have this association that detracted from his acting. Another character problem is the depiction of Aragorn as preoccupied with doubts. Aragorn's character is revealed by events and not shaped by them. Frodo's character, like Bilbo's in The Hobbit, is shaped by events. This aspect of Aragorn's character depiction is one of Tolkien's wonderful inventions. The reader knows that Aragorn is the King. The men of Rohan and Gondor do not know this. Aragorn must demonstrate his character by his actions. If his character was undeveloped, he would not be able to confront Sauron in the Palantir, travel the Paths of the Dead, summon the spectral army at the stone of Erech and heal the wounded from the black breath. Viggo Mortensen and Peter Jackson depict him as full of doubts. This makes him vulnerable and a more sympathetic character. I guess there are positive aspects to either depiction, but how could a King with doubts travel the Paths of the Dead? 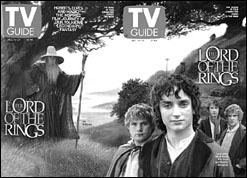 Other minor problems in character depictions include a fight scene between Gandalf and Saruman. Wizards this powerful would likely just stare each other down. A knock-down drag out fight with blood and bruises had a cartoon feel. There was also a brief scene in Rivendell where Bilbo sees the ring around Frodo's neck. His face was transformed by a special effect into a little demon. A girl in the audience actually laughed when this happened. Using his considerable acting skills, I think Ian Holm could have convinced us of Bilbo's obsession with the ring without the use of a special effect. One of the most underrated actors in this movie is Sean Bean, the actor who plays Boromir. He did a perfect job and should have been nominated in the Academy Awards as a supporting actor. Ian McKellan should have been nominated for best actor. We cannot forget Sean Beans lines because they are well-written and he delivers them perfectly. Referring to Mordor: "There is an evil there that does not sleep." Here are some others: "They have a Cave Troll",referring to the Balrog, "What is this new devilry?" His skill as an actor is very evident in his scenes with Viggo Mortensen. Who do you remember from these scenes? Mortensen's speech has little emotional inflection; Sean Bean uses emotional tone as a compliment to wonderful lines: " I would have followed you my brother, my captain, my King". Events. 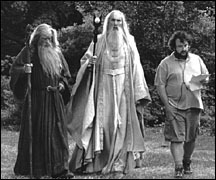 In order to produce a movie from The Lord of the Rings, a screenwriter must delete major parts of the plot and numerous details. Everyone understands that something must be deleted in order to fit this great tale within the temporal confines of conventional films. Although fans can tolerate deletions as a part of editing, they will never tolerate additions to the tale. I think Peter Jackson did a great job with the deletions but sinned in his additions. Although numerous events were deleted, the plot follows the story line of the book. Since the events up to the entry into Moria were compressed, they have a choppy feel. It amounts to taking all the active scenes and presenting them one after another. There is little down time for recovery. The entire movie has this quality but it appears most pronounced in the beginning. However, I should also assert that many individual scenes in the beginning were superb. The scene of Gandalf and Bilbo smoking in the evening charmed everyone. The fireworks at Bilbo�s party were amazing and demonstrated the best of special effects. Regrettable were all the missing poems and storytelling from the original tale. There is a lack of savoring the beautiful settings. After all the effort to create Rivendell, the movie only lingers there apparently the afternoon of the council of Elrond. 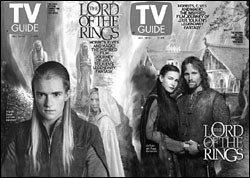 Scenes of the elves singing and Aragorn telling stories were traded for the later action scenes. This action is compelling and expertly done but reliance on them detracts from development of characters and settings. As an addition to the story, we have the Arwen problem. Arwen wields a sword and actually playfully places it at Aragorns throat when he is looking for Athelas. This was foolish. No one playfully puts the blade of a dangerous weapon at the throat of someone you don't want to kill. No one sneaks up on a Ranger. Arwen also takes the role of Glorfindel and carries Frodo to the ford of Bruinen where she calls up the river and vanquishes the black riders. Arwen is the daughter of a very great and aristocratic elf. She would be no more likely to wield a sword and search for Aragorn than Galadriel would do this. It is very unlikely that she would be sent alone against the Nine. This was an obvious manipulation of the audience: we apparently need to see gender diversity in every movie. We have Xena, what more do we need? I can only hope that studio executives held Peter Jackson's naked feet to the flames over this one. Otherwise, all his apparent knowledge and sympathy with the great tale dissolves into a patter of hypocritical drivel. Now, for the great parts. Once The Fellowship enters Moria, the movie takes off. It becomes almost completely action oriented but this is generally consistent with the tale. Much of the action, such as the fight with the cave troll, was extended, other sequences, such as the fight with the Balrog, appeared compressed. The computer-generated monsters were excellent. The acting around them worked perfectly. I never had the feeling of discontinuity. Cave trolls and Balrogs really exist. I saw them. The scenes in Lothlorien could have been extended. Peter Jackson left out the relationship of Gimli to Galadriel, and all the gifts except for the phial. The scene at Galadriels mirror was pure Jackson. Imagining herself in possession of the ring, Galadriel distorts into a very wraith-like queen. 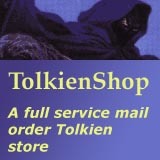 I thought the effect worked well and Tolkien�s prose includes descriptions like this. The scenes at Amon Hen deviate from the story but follow the basic plot line. The fights with the Orcs were awesome. The death of Boromir is the most dramatic, moving scene of the film. I have yet to read a review that comments on the previous movie by Ralph Bakshi. Peter Jackson and New Line Cinema owe him a great debt. He prepared the Tolkien fans for a new edited version of the story presented in cinema. For example, we did not expect to see Tom Bombadil (to the great disappointment of my daughter) because he was edited from the Bakshi movie. The Bakshi movie also gave subsequent screenwriters a logical plot sequence and demonstrated how much editing and compression might work. If one makes a direct comparison of the Ralph Bakshi and Peter Jackson movies, Bakshi was actually more consistent with Tolkien's story. For example, the attack at Weathertop in the Bakshi movie was virtually the same as the book. Peter Jackson has Aragorn going off somewhere then jumping out in surprise. Why would Aragorn leave the Hobbits undefended? It was a simple manipulation of events to render more surprise and action.It is not a fatal flaw in the scene but introduces inconsistency that detracts from a convincing story line. I learned something from all the build-up to this film that I never experienced before. Viewing all the previews profoundly detracted from the film. By the time I actually saw the complete movie, most of the surprises and other interest were spoiled. I do not plan to view any previews or trailers of the next movie and I would strongly encourage other fans to do the same. I want to see Eowyn, Faramir and Ghan-buri-Ghan for the first time up on the big screen, not on a small RealPlayer window on my computer. I might even wait until 2003 and see all three movies at one sitting. In summary, The Fellowship of the Ring is a great movie. I have seen it twice so far. The second viewing was better than the first. If you can keep your eyes closed during the Arwen sequence then you will witness a nearly perfect visual realization of Middle-earth.